Why Get Safe Zone Certified? Pronouns are part of our everyday language. Often times it is difficult to speak without using pronouns and they are an important part of language. However, their use in understanding gender is often underestimated. Respecting the pronouns that someone uses is important in treating people with respect and creating a safe and welcoming place where all can pursue their academic goals. Everyone has pronouns and we believe that pronouns matter. Some gender pronouns are neutral (them, they, theirs), some are not (she, he), and some have been created as an alternative to or rejection of the gender binary. Everyone has the right to use the gender pronouns that match their personal identity. These pronouns may or may not match their gender expression (how the person dresses, behaves, or looks). What is a gender neutral/ gender inclusive pronoun? A gender neutral or gender inclusive pronoun is a pronoun which does not associate a gender with the individual who is being discussed. The dichotomy of “he and she” in English does not leave room for other gender identities. Ze, hir (Xena ate hir food because ze was hungry.) Ze is pronounced like “zee,” can also be spelled zie or xe, and replaces she/he/they. Hir is pronounced like “here” and replaces her/hers/him/his/they/theirs. You cannot always know what someone’s gender pronouns are by looking at them. Asking about and correctly using someone’s gender pronouns is one of the most basic ways to show your respect for their identity. When someone is referred to with the wrong pronouns, they may feel disrespected, invalidated, dismissed, alienated, or dysphoric (or, often, all of the above). It is a privilege to not have to worry about which pronouns someone is going to use for you on the basis of how they perceive your gender. If you have this privilege yet fail to respect someone else’s gender identity, it is not only disrespectful and hurtful but also oppressive. Try asking: “What are your pronouns?” or “Which pronouns do you like to hear?” or “Can you remind me which pronouns you like for yourself?” It can feel awkward at first, but it is not half as awkward as getting it wrong or making a hurtful assumption. On campus, you may hear a student, faculty member, or staff member using the wrong pronoun for someone. In most cases, it is appropriate to gently correct them without further embarrassing the individual who has been misgendered. This means saying something like “Actually, Xena prefers the pronoun she,” and then moving on. If other students or faculty are consistently using the wrong pronouns for someone, do not ignore it! It is important for everyone to know that you are their ally. It may be appropriate to approach the person who has been misgendered and say something like “I noticed that you were getting referred to with the wrong pronoun earlier, and I know that that can be really hurtful. Would you be okay with me taking them aside and reminding them about your preferred pronouns?” Follow up if necessary, but take your cues from the person. Your actions will be greatly appreciated. What are ways that faculty and staff and introduce gender pronouns? That’s okay! It happens to everyone. It takes time to adjust to new ways of speaking and thinking. If you use the wrong pronoun, apologize, correct it, and then move on. If you realize your mistake after the fact, apologize in private and move on. Avoid continually talking about how bad you feel for making the mistake, because it could make the person feel like they need to console you and/or create uncomfortable or unsafe environments for them if others are not aware of differences between their preferred and legal name/pronoun. What are some pronoun dos and don’ts? 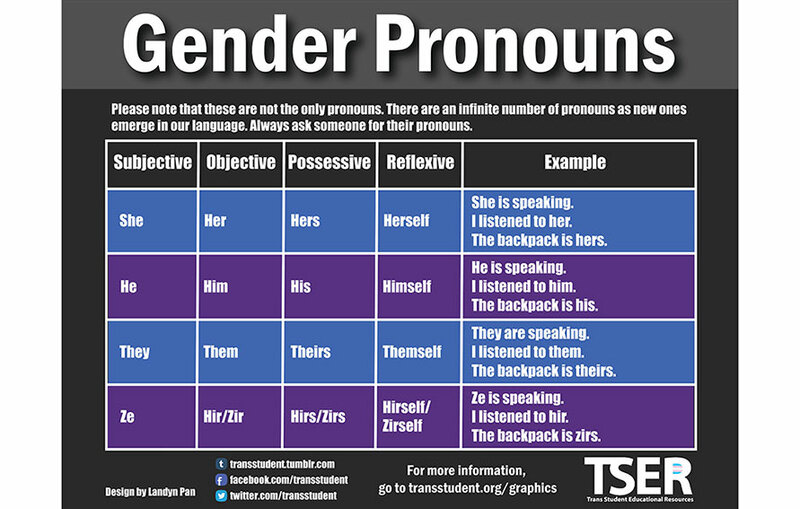 Check out this graphic for pronouns dos and don’ts.